Below is a summary of how to replace the Vesconite Aft Washer and Sleeve in a K3 unit. It also covers how to dis-assemble the unit for whatever reason. Typically if you are replacing the aft washer it would always make sense to replace the sleeve at the same time. Any failure of the washer allows movement of the blade carrier assembly which has the potential to damage the sleeve. Early model PETP sleeves which are coloured white - should always be replaced with Vesconite sleeves used in all units post ~ 2008. These are fibre reinforced and have not recorded a failure in service as yet that we are aware of. Vesconite coloured a near black has unique bearing properties and will operate with either water and grease lubrication. The final step post re-assembly requires pre-tensioning the internal torsion spring. This may be needed to be undertaken as a seperate step independently if the Nose Cone has been moved - typically as the result of a rope wrap and requires resetting back to the original location thus ensuring the internal spring tension is correct. The first step is to remove the unit from the shaft using a puller or Saildrive and mount over a vertical spigot held in a vice with the nose of the unit uppermost. Locate the alignment marks punched on the boss - see last page of K3 OPERATING MANUAL. Copied below as last image. Mark relative position of all parts with indelible marker by drawing a line fore and aft across entire unit over the alignment marks. Undo all 4 cap screws completely until they are no longer moving out - this ensures they are free of the other half of the nose cone. Lever off the half that holds the cap screw heads with a screw driver in the polyurethane joint line. Use a screwdriver as a wedge to start in the joint line. Lever of the other half that tails the spring with a screwdriver between the Boss and Nose cone - lift the half cone off the spring tail. Clean up the internal surfaces the cone will reside on - including the groove recessed in the Boss - using mineral turps or similar. Clean up the boss section protruding to enable free movement of the Blade Carrier assembly to slide off the Boss. Lift the Blade Carrier assembly including all 3 blades off the boss - you will need to simultaneously position all 3 blades at 90º to the axis to prevent the blade roots jamming on the spherical boss. Remove the old washer and sleeve. Clean the internal sections of the Blade Carrier paying particular attention with a sharp pointed object to clean the recessed area where the new washer is to go. Clean the outer section of the boss and ensure the washer will fit neatly down with no obvious air gap between the left hand side of the L washer and the forward outer section of the boss that accepts this surface. Ensure the L sectioned washer pushes neatly into the Blade Carrier with the base of the L going into the Blade Carrier recess. Prior to final assembly smear all surfaces with a marine grease and re-insert the sleeve and washer into their respective final positions. Now place ~ 20 ml of marine grease in each of the two recesses between the driving dogs of the Boss and Blade Carrier respectively. 80 ml in total. Slide the Blade Carrier assembly back to it's original position with all alignment marks as they were previously. Again you will need to hold all 3 blades so they are at 90º to the axis and the blades are in the correct position for whatever hand the propeller is. Now after any cleaning replace the Tripod & Torsion spring back onto the Blade Carrier - again using the alignment marks to ensure the Tripod returns to it's original position. Smear a very very thin coat of polyurethane ( Sika or 3M ) over the nose cone with the spring tail hole semi circle that will contact the boss. Excess material will cause the Nose Cone to " float " when re-assembled and allow the pre-tensioned spring to in effect " unwind " the Nose Cone back to an incorrect zero tension position. Smear a very thin coat over the boss area now exposed. Make sure no excess will end up in the spring recess when the mastic has set and cause binding as the spring is constrained when tensioned further during a reverse initiation. Ensure a 45º ramp of mastic around the forward end of the thrust groove on the boss to ensure the nose will be forced aft to eliminate any fore and aft tolerances due to wear over time. Tap the each half of the Nose Cone aft to eliminate any wear or excess tolerances in the assembly. While all components should fit leaving an as built 0.004" - 006" clearance - multiple small machining tolerances can collectivly alter this. This will not be an issue with just an Aft Washer replacement which as just one item will be very close to the previous dimensions. Insert any < 6 mm Ø screw driver into the hole in the forward section of the Saildrive nose and use as a lever to rotate the entire nose to re-align the marks as before. You will need to hold the boss with Reverse Rollers against this torque. Spring tension should then be as before and it should take 2-3 lbs of force at the blade pin to start to tension the spring. 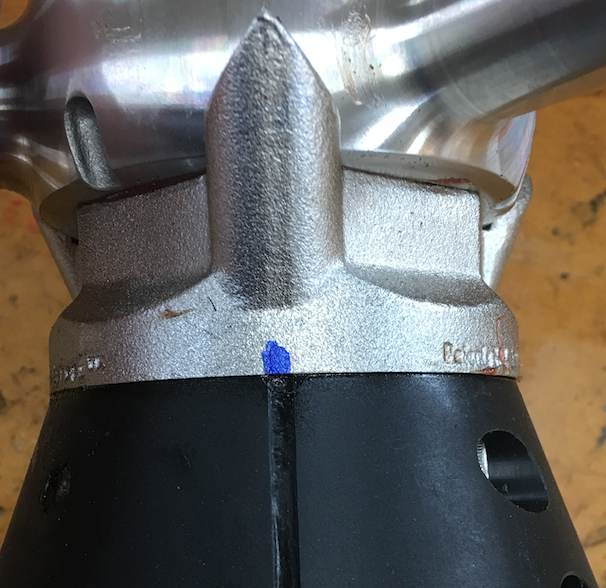 For shaft nose cones insert the Allen Key into one of the cap screws and use as a lever to generate spring pre-tension by restoring the Nose Cone to it's original at the as marked location. Check the original alignment marks are now still in line as originally marked. The torsion spring can tend to restore the Nose Cone to a zero tension position if there is excess polyurethane and the Nose Cone is in fact " floating " on the boss and will gradually creep back to a zero tension status. Tapping the blade carrier arms gently forward using a rubber hammer near the center can assist in adding tolerances / clearance to free up the assembly of it is binding. The polyurethane when set will absorb forward thrust and ensure the relative position of the Blade Carrier on the boss is retained permanently. If the vessel is handy it may be easier to temporarily mount the unit back on the shaft or spline simply as an easy way of holding the boss secure while completing the pre-tension and clean up routines. Wipe off excess polyurethane with a spatula then clean up with a mineral turpentine rag. In the cae of Saildrives - include the front face in the clean up to ensure clean contact with the Saildrive when finally mounted. Allow the polyurethane to harden which can take some time. The next day is optimal or the polyurethane can be very messy until the surface hardens. Grease the unit fully as per our web site video or OPERATING MANUAL instructions and your good to go. Tensioning the spring will always the effect of moving the trailing edge of the blades towards the Reverse Roller. The Blades should then be free to move freely from an Ahead position - with the Pitch Screw touching the Tripod pitch face to trailing aft parallel to the drive shaft and then over center by 25º past the axis to allow for feathering of the Blades when the streamline of the water due to shaft angle, rising buttock lines or leeway under sail generates this situation. Note the position of the Cap Screws as the joint line on the other side will be in a different location relative to the Blade Carrier. This is because there are two joint lines but three tripod legs - Assembly is therefore not symmetric with regard to the Blade Carrier. ALIGNMENT MARKS: The red dots below highlight a series of alignment marks punched when the unit was first assembled that both show the relative position of the components and also set the internal spring tension correctly. It is critical that this alignment is maintained post final re-assembly.